Hello! This is the third day I've been attacked by flu, and after two days forcing myself to work, I officially gave up today. Hehehe.. Well I supposed to work on my thesis, but I think I'm gonna spend my hours watching DVDs and surfing people's blogs (my favorite activities in the whooooollllee world). Recently, I love reading blogs from fashionable people. Usually, these people (most are girls) take photo of themselves and post it into their writings daily. Not to forget, they also tell the readers where they got that stuffs, following the price. I first knew one fashion blog is from Hot Chocolate and Mint, belongs to Diana Rikasari. I think she is a brilliant girl! Not only she's a die-hard fashionable girl, but she's also effin' creative that she can make a tie-dye pants by her own. 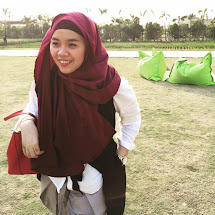 From her blog links, then I found out that sooo many Indonesian girls who have their own fashion blog too. As far as I know, Indonesian people has a rapid and significant changes in their taste about fashion. If we look back in the year 2000s, where would you find girls wearing a black tights and a neon pink high-heels in the mall? We used to think that those kind of styles are just for Japanese teenagers hanging out in Shibuya where no people would stare strangely at them. I also read some old magazines from my collection back when I was 16-17 years old, and rarely find "fashion spread" pages in them. And if you do, don't you just pass that pages, because the clothes are kind of haute-couture style, not affordable, and odd? But now, you can find stylish people everywhere. Stylish here means that they "dare" to put something "WOW" like knee boots, unmatched pairs of top and bottom, and even glittery leggings. Fashion spread rubric in a magazine is a MUST, and it becomes more inspiring to see. And if we look back again, fashion industry never been this promising. You name it, fashion designer, fashion buyer, visual merchandiser, fashion editor or fashion stylist are just a part of the long list fashion professions. Despite my job as an editor in teenage fashion magazine, I don't see myself as a fashionable person. I don't like wearing bright colors, and I don't have any courage to wear something that a little bit quirky. I have too much ordinary taste like skinny black pants, plaid shirt, some colorful shawls, and flat shoes. Sometimes I gazed into my fashionable friends at office and some stylish people I met, I can say I'd love to be one of them! But mostly, that wish let be a wish, because then I end up buying stuffs that I feel safe in them. For me, change in fashion is like.. an courageous jump! I don't exaggerate because in my opinion, if you change your style, it means you are ready to receive strange look or comments (positively or negatively) from people, and it also changes the way you see yourself in the mirror. I just admire girls with their witty taste of fashion, yet brave to go out from their house and let the people have their own interpretation. I think these girls exactly know how to appreciate themselves. They love their body and they put fancy stuff from top to toe to make it look incredibly good. Me? I'm on my way to find something to appreciate myself, and I see being more fashionable is worth to try. Oh.. As a starter, I bought one pair of red Vincci boots yesterday by online. I don't have any guts to wear it. Encourage me, please!